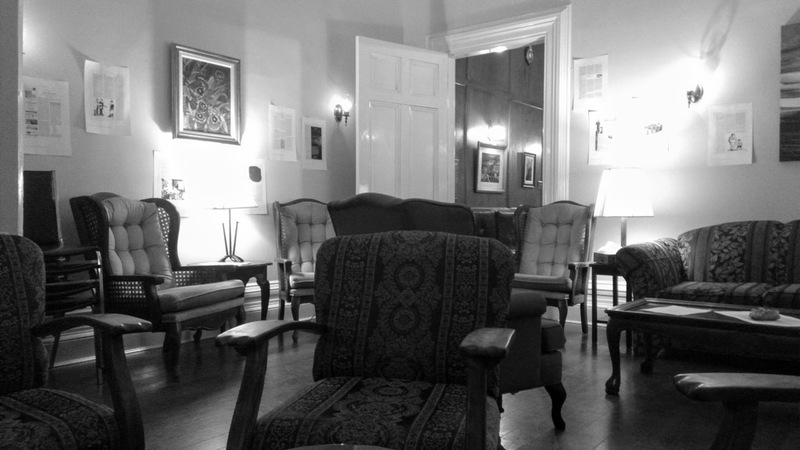 Our hearty band of Prince Edward Island subscribers to The New Yorker–about a dozen of us–gathered in conclave last night in the lounge of The Haviland Club. As it happened, the annual meeting of the Charlottetown Yacht Club was happening in the room next door, meaning that there might never before have been a greater concentration of the Island’s pompous (it’s notable that there was one person who lives in the union of the two groups who opted for the Yacht Club gathering, which, I think, marks it as being slightly more pompous; but it’s a toss-up). Our gathering was everything I’d hoped it would be: a motley collection of young and old, rural and urban, longtime subscribers and aspirational ones. Among us were someone who had achieved the hat trick of visiting the New Yorker’s offices, volunteering at the New Yorker Festival, and having had supper with Calvin Trillin. We heard the tale of a subscription shared between brothers, then inherited when one brother died, then passed along to the next generation (what a life those copies must have had as they wended through the extended family). Only one of our number had ever entered the cartoon contest. Nobody had pitched the magazine on a story. Yet. There was a rainbow of opinion about reading the magazine online, ranging from my originalist position that it is only truly experienced on the printed page, to those who are daily, enthusiastic consumers of the website in a way completely foreign to me. We talked about whether we read the fiction (ranging from “never” to “sometimes it’s all I read”), whether we read the poetry (“always” to “The New Yorker prints poetry? !”), and whether we read the front-of-book listings (almost everyone seems to, even though we’re 2000 km away from New York and the magazine arrives a week late). We reviewed a dossier of editorial mentions of Prince Edward Island in the magazine over the last 93 years, running from casual mention of Malpeque oysters to the 1996 article by the aforementioned Trillin about Anne of Green Gables. Plans to ferry back issues to the aspirational were arranged. Email addresses exchanged. Feelings that we might someday do it again were floated. My thanks to journalist Meg Campbell for being the catalyst to bring us together; Meg was there last night, with her inquisitive ears on, and it wouldn’t surprise me if something arises out of this from her pen. Written March 1, 2018 at 10:46 a.m. This sounds like it's a lot of fun! So tickled about this and so sorry to have missed it. Hope to read something about it.